Hortons are pleased to offer for sale this fine country family house, off a private gated driveway with mature land, gardens and paddocks measuring approx. 14 acres. Dexter Grange sits within a private position on the edge of the picturesque village of Hurley. A substantial detached house with equestrian facilities including ménage & stables, along with an excellent range of outbuildings offering scope for development for a variety of uses (subject to consent) all within secure grounds. Viewings are highly recommended to appreciate the aspect of the site and its full potential. A stunning six bedroomed equestrian property with development potential. Comes with circa 14 acres, ménage, stable block, industrial units, planning permission for 3 bed dormer bungalow, and an unconverted coach house. The internal accommodation totals approximately 4101 sq ft, making the house exceptionally spacious. The property offers multiple outbuildings, ample parking, stables & ménage all within secure grounds. The property briefly offers entrance hall, fitted breakfast kitchen, dining room, utility room and snug, living room and cloakroom on the ground floor. On the first floor are five bedrooms including the master and en-suite & dressing room, as well as the family bathroom. The self contained flat/annex has a lounge, fitted unit, bedroom & bathroom. There is further development potential to outbuildings. 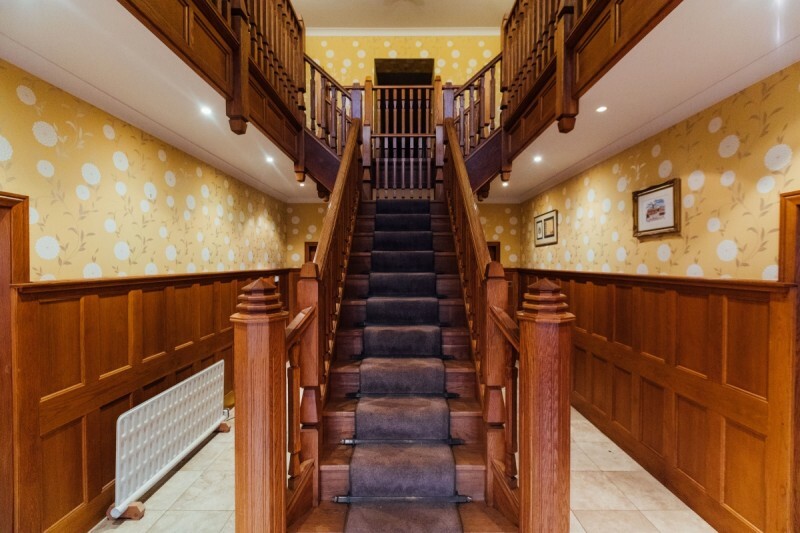 The property is accessed via a grand panelled entrance hall. This in turn leads to a stunning breakfast-kitchen which has integrated appliances and a breakfast island, which leads to a cloakroom and a utility area. Off the kitchen is a snug with multi fuel-burner. 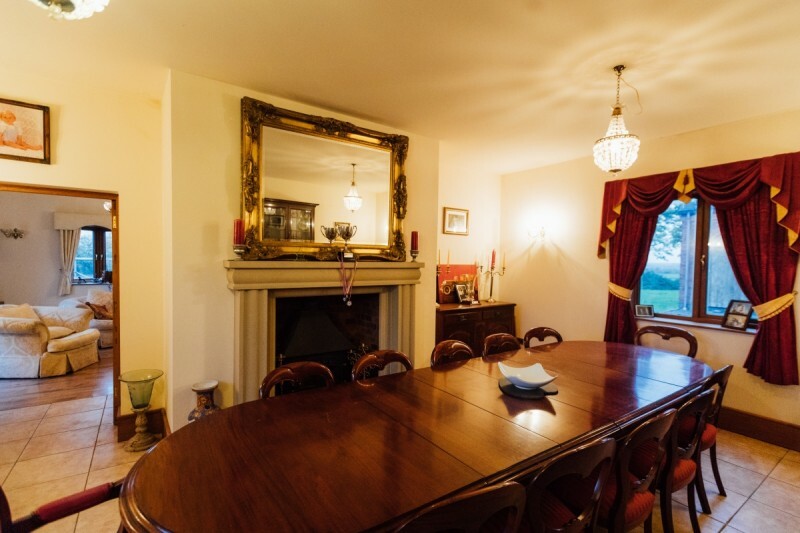 From the main hall you will find the dining room, and the generous lounge with a feature fireplace and garden views. The galleried landing leads to five bedrooms, two with en suite, family bathroom & master suite with dressing area & bathroom, all of which are an excellent size. On the second floor, there is a staircase leading to the loft (with potential to convert). From the lounge there is a staircase leading to a self-contained one bed apartment, lounge with feature window with stunning views, bedroom & ensuite. To the rear of the property leading from the utility is an unconverted coach house measuring 1613 sqf with stairs leading to office. Outside, the property comes into its own with 14 acres of land including two paddocks, a ménage, two stable blocks totalling 9 stables, planted woodland, planning permission for 3 bed dormer bungalow (plans available on request). There are also two industrial units - unit one is 5986 sqf, and unit two is 1385 sqf, courtyard, formal gardens, parking and much more. The property would be ideal as a small holding or equestrian centre, subject to planning permission. Dexter Grange sits within a private position on the edge of picturesque village of Hurley. 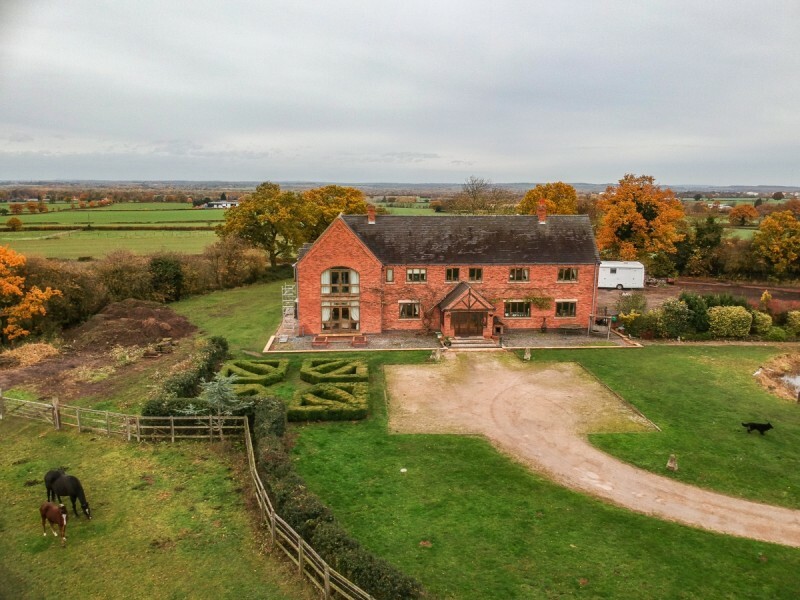 The property is very well placed for accessing the major road networks including the M42, M6 and M1, with a mainline railway station easily accessible at Tamworth. The cities of Birmingham, Coventry, Leicester, Nottingham and Derby are all within driving distance. There is a range of well-regarded schools in the area including Twycross House School, Twycross Preparatory School and The Dixie Grammar School at Market Bosworth. The property is situated on the outskirts of Hurley, a small but active village with a post office, newsagent, primary school, several businesses and a public house. It is ideally located for access to the M42 and the A5, as well as the M6 Toll. Both The Belfry and Kingsbury Water Park are nearby, as are Tamworth (c.8 miles) and Sutton Coldfield (c.12 miles) town centres. It is an idyllic rural spot.